Thanks to Channel North for doing a great job of covering our conference. Thanks also to Northland Inc for supporting production of these videos. This short video provides an overview of the conference. We are in the process of uploading videos and you can access them from our conference pages. Here is the first of our two keynote speakers, Anne Palmer of the Center for a Livable Future at Johns Hopkins University. Anne was a keynote speaker for the Local Food Northland Conference in February this year. 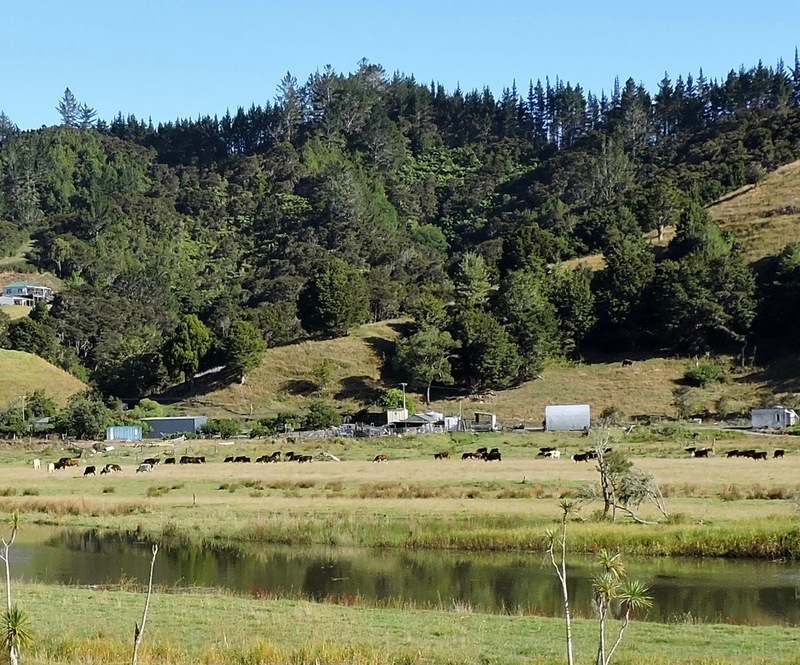 In this post she reflects on her time in New Zealand. See the original post here. A failing dairy industry. Streams polluted by animal manure. Consolidated food retail, inadequate slaughter facilities for small – and medium-size producers, the list goes on. Where am I? New Zealand. Yep. Before I stepped foot on the soil, I was cautioned that I should not believe the “cleaner, greener” moniker. I’m not sure if it was heartening to blow up the myth and realize we are all suffering from industrialization of the food system, or just depressing that problems in the food system are dispersed so far and wide. The solutions are dispersed, too. Back in September, Peter Bruce-Iri from Local Food Northland invited me to New Zealand to keynote and participate in a two-day food conference. 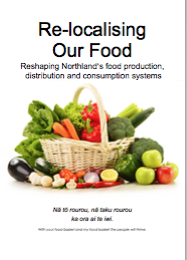 He had studied the food council model and wanted to introduce it as part of a larger strategy for rebuilding the Northland’s regional food system. It took me about 30 seconds to make my decision (even with my carbon footprint in mind). How could I say no to New Zealand? Peter suggested additional connections for me to make my trip even more meaningful, including a webinar for the Good Food Network organized by Emily Dowding-Smith from the Sustainable Business Network and a workshop with Healthy Families Rotorua, arranged by Jasmin Jackson.The original plan was to hold an advance food-foraging event that would provide food for the conference. (I imagined myself in an Omnivore’s Dilemma scenario, but the wild boar would remind me of Wilbur in Charlotte’s Web). That plan was thwarted by regulations that prohibit the sale of food that has been “caught wild.” Nevertheless, thanks to Ian and his sous chefs, I gained three pounds in eight days. And every pound was worth it. Even though we were unable to forage for our meals, most of the delicious food was sourced locally. I spent my Saturday morning at the Whangarei Growers Market with Jeff Griggs, a co-founder of the Local Food Northland endeavor. Jeff is an American who immigrated to New Zealand many years ago and now farms avocados and cut flowers, along with other produce like kiwifruit outside of town with his dog, Ted. The oldest growers market in New Zealand, Whangarei Growers Market regulates that you can only sell what you grow, and Robert, the market manager and 70-year-old farmer, explained he has no problem tracking down the offenders because the produce looks different. I watched him collect the $20 stall fee from vendors while we shopped for Luisa plums, blueberries and lavender products. (Note to self: organize trips based on seasonal harvesting schedules). After the market, Jeff invited me to join the weekly Whangarei Transition Town meeting at the local library where residents discuss ways they can improve self-sufficiency at the local level. Originating in the UK in 2006, the Transition Towns movement seeks to address peak oil and climate change, and challenge the notion of unlimited economic growth. We had a lively discussion about school gardens, people’s eating habits, electric cars (thanks, Ross) and more. Over the two days, we heard from Peter about the features of a sustainable food system and importance of scale-appropriate policy. Ruth Marsh introduced the Vermont Farm to Plate framework, which Local Food Northland has been using to guide their regional effort. Rangimarie Price talked about how Maori principles on sustainability are embedded in the local food strategy. Jeff discussed how to connect and build a network for collaborating. There was a lively discussion about the role of chefs and restaurants in supporting local producers. 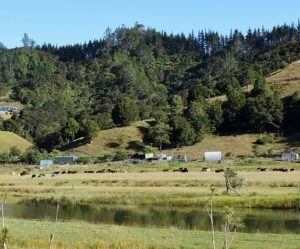 While some of the larger cities have capitalized on the farm-to-table concept, in smaller cities like Whangarei, chefs are sourcing from local growers with very little or no marketing efforts. I joined the policy discussion for the small group breakout and heard Regina, a NorthTec student and single mom who is working with faculty on various food endeavors, bemoan the demise of her kitchen garden this year because she is going to school full-time and raising her four children. I have heard this same conundrum in many focus groups and community meetings in Baltimore; doing the “right thing” frequently falls on the backs of those who have the least amount of time. On Day Two, we heard from renowned nutrition scientist Barbara Burlingame about sustainable diets and nutritional superiority of native bananas versus the Cavendish variety that is ubiquitous in supermarkets around the world. Northland has a variety that reminds me of passionfruit, and there are discussions about reviving that industry. (Lucky for Northland, Barbara just moved back to Wellington and joined the faculty at Massey University after 16 years at FAO in Rome as the deputy director of the nutrition section). Dr. Melissa Gilbert, an integrative medicine doctor, discussed her efforts to get patients to grow and eat from backyards. Dr. Laupepa Va’a from the district health board talked about food recovery efforts in Northland. A diverse panel of growers debated the challenges they face from a policy and climate perspective, while another panel focused on the role of food hubs in rebuilding distribution systems. Clive McKegg, the third leg of the Local Food Northland founding members (along with Peter and Jeff), wrapped up the conference by discussing how the Local Food Northland’s mission “to establish Northland as a centre for growing and processing tasty healthy foods in ways that build community cohesion, increased economic resilience, improve health outcomes and enhance the natural environment” can be actualized in their collective efforts. I left inspired and remain inspired as I witness the conference follow-up on the Loomio online platform, designed by a New Zealand company. After my time in Whangarei, I traveled to Rotorua, which was challenging. I liken this part of the journey to the 80s classic movie, Planes, Trains and Automobiles (think Buses, Cars and Hitchhiking). Lucky for me, Hayley, another conference attendee, was scheduled on my flight and she took the reins to get me to my destination that day. I strolled around Rotorua’s thermal lake, careful not to step in a bubbling hole, and enjoyed the hotel’s thermal pools while preparing for the second workshop. Jasmin Jackson from Healthy Families Rotorua invited me to meet with groups from Rotorua and Tauranga who have been engaged in food and nutrition activities in their area and want to expand to policy. About 45 people attended the workshop, many from the public health sector. Healthy Families, working in 10 locations across New Zealand, is a national initiative that seeks to create health-promoting environments in the community and is involved with food policy efforts in other parts of the country. We talked about the opportunities and challenges associated with local food policy and ideas for strengthening their network. Even with the central government driving most legislation, I learned that New Zealand’s regional government structure offers options for organizing, especially around regulations for small-scale growers, land use, distribution networks and public health. I heard several participants talk about the importance of policy being informed by research, opportunity to expand public health mapping to other food system components and the need to better understand existing supply chains to improve distribution. I travelled 23 hours to find myself in a beautiful location (since this is a food policy blog, I did not talk about the beautiful beaches, frolicking dolphins or the rails-to-trails bike ride, but those were also remarkable) that is facing many of the same issues we have in the U.S., albeit at a different scale. It is a scale that may serve them well as I witness the conversations among the conference participants already deciding how to move forward. I invite them to share their challenges and successes with us here in Crazy Town, where microwaves spy on you. Our inaugural conference was a great success… so far. We believe it was the first Northland event to bring together people from diverse interests in food production, distribution, consumption, diet and health, hospitality and education specifically to focus on the move towards more sustainable food systems. The opening powhiri at Te Punu o te Mātauranga and welcome from our Mayor, Sheryl Mai, set the scene. We have the great bounty of presentations from visiting experts – Anne Palmer from Johns Hopkins University and Professor Barbara Burlingame from Massey University. The benefits of connecting with other people that share aspirations towards a stronger local food economy was a common focus of feedback of those attending. Since the conference, there has been a continuation of discussions in Loomio and further connections made. Channel North is in the process of creating a range of videos about the conference and these will be available here soon. A feature of the conference was the superb food, mostly sourced locally and beautifully cooked and presented by Ian Sturt and his team. For the conference to be judged a success, we will need to be able to look back at the end of the year and see significant progress on the goals currently being formulated. Thanks to our sponsors, enabling us to keep the cost of the conference affordable. NorthTec provided the venue and great support, Northland Inc supported our planning and organised for Channel North to film the event. Thanks to the Far North District Council and Te Tai Tokerau PHO for support through the Kai Ora Fund. And thanks to all of the cafes, restaurants and food sellers that supported with food. Please support the business that support local food – there logos are below. At our Local Food Northland Conference, we have a panel on food hubs. Most Northlanders don’t have direct experience of food hubs, so this video from Farm to Institution New England illustrates how food hubs can support the development of local food production, the downstream economy and jobs, and consumers. We are delighted to open our conference for registration. There is a diverse and inspiring programme including some high-profile presenters. These include Professor Barbara Burlingame from Massey University (left) and Anne Palmer from Johns Hopkins University. Our conference pages provide information about the programme and has links for registration. Please pass this on to your networks. Dr Barbara Burlingame will be presenting at the Local Food Northland conference on 13 and 14 February at NorthTec next year. Dr Burlingame achieved her undergraduate degree at the University of California and then was awarded a PhD from Massey University. She is returning to New Zealand to take up a new role at Massey. We are fortunate to have a presenter of such calibre here. She has spent the past 16 years based in Rome, working for the Food and Agriculture Organisation of the United Nations, including the last four as Deputy Director of the Nutrition Division. The following video reveals her knowledge on nutrition, diet and sustainability – a great fit with our aspirations. You can read more about her here. This video, from North Canterbury Vineyards, tells an inspiring story of a food forage banquet. Perhaps we could do something similar in Northland for the Local Food Northland conference on Monday and Tuesday, 13 and 14 February? Those registering for the conference could join the forage the weekend before. There are deer in the hills here I’m told by a reliable source. There is plenty of fish in the sea in February, lots of blackberries supplemented with visits to Northland’s fine growers, farmers, beekeepers and home gardens. North Canterbury Forage from North Canterbury Vineyards on Vimeo.